So I haven't done any art at all, but here's a journal page I finished up before the holiday weekend. I made it by layering colored paper, old sewing patterns, paper from an old phone book and and some printed tissue paper. Then I added some stamped images, some paper measuring tape (left behind by one of my husband's visiting nurses) and a cloth bow. I colored the stamped stars with a gold marker. 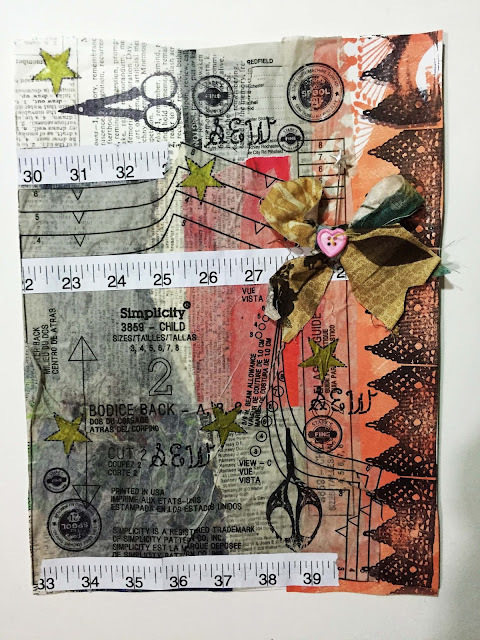 I'm linking up to Art Journal Journey. This month Susi is hosting and the theme is collage-but NO faces, leaves or wings. I know November is winding time but there is still time to join in. And I am also linking up to Try It On Tuesday. The present theme is layering, and I think this page works just perfect for that. So I hope everyone is having a wonderful weekend, and enjoy what is left to it. Are those scissors stamps? If so, I have stamp envy! They are awesome. LOVE the page. It really spoke to me. I'm about 3/4 decorated, but took more time out to spend Saturday with a sick friend. Unlike you, the only shopping I've done is at the grocery store. But I finished the last of my laundry about an hour ago, and have washed all the dishes I intend to use between Thanksgiving and Christmas. I do it every year, whether they need it or not. At least all my trees are out. Have a fun week at school. A fantastic page - just super ! Great you enjoyed Thanksgiving! Thank you for joining the No No No theme again! I like your page very much, beautiful colors and cool collage! It reminds me on the days, when I sewed my clothes by myself. Its a wonderful page Erika, fantastic layers of sewing details and papers. Enjoy the rest of your break. p.s. Thank you for sharing this page with us over at TioT's. You're a brave woman to shop this weekend. I don't go to the store -- any store. I'm starting with decorating but we've had lots of food times which means cooking (which I love) which means less decking the halls. This too will move forward. Mostly, I am enjoying being with family and friends. That's the best of Thanksgiving! What a pretty page. I like the warm colours, the green stars and the bow and the way you have made it all come together. I am in awe (always) of the way you make art amid all your other activities. Thank you also for joining Try It On Tuesday dear Erika! Gorgeous page. Thank you for joining us at TioT. A great page Erika, love the sewing theme. Love the fact that you've used a real sewing pattern as one of your many layers.